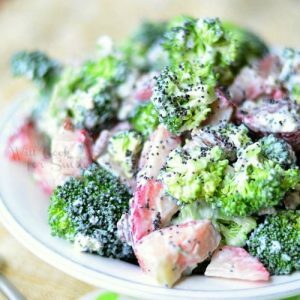 This Strawberry Broccoli Salad is made with fresh broccoli, strawberries, goat cheese, sweet Greek yogurt dressing and topped with poppy seeds. Combine broccoli, strawberries, goat cheese and pecans in a large mixing bowl. In a small bowl, mix Greek yogurt, maple syrup and lemon juice, mix well. Mix the dressing into broccoli mixture until all evenly coated. Add some salt and poppy seeds, mix well.